When a website ranks top on Google or any other popular search engine’s first page, it means the business’ prospects are high. But what does it take to be listed on a search engine’s first page? Well, you’ve probably heard of Search Engine Optimization a hundred times already, and you may be one foot in exploring Shopify SEO. Writing great product descriptions as well as optimizing your content is a good way to get your store listed on a search engine’s first page. Once you are done with the keyword research for your Shopify store, crafting the titles and the meta descriptions are two crucial factors for SEO. However, it’s not just about using your keywords. There’s a lot more you can do. Here is a simple guide to writing exceptional meta title and descriptions. To understand what Meta Description is, let’s begin with a simple example. Every time you want to search for something on Google, you key in a search query. Once you press the search button, you will be directed to Google’s Search Engine Results Page (SERP). On the SERP page, what you see are meta tags. A meta tag has two parts which include the “Title Tag” that appears as words on the top part of every SERP in blue color. It’s usually within 70 characters. Just below it is a short description that does not exceed 320 characters (earlier it was limited to 160 characters).This short description is the meta description. i) Title and Meta description are one of those numerous factors which help the search engines to understand the purpose of the page and serve it accordingly in the search results. ii) A well-crafted title and meta description can influence the clicks on the search result page. Why are clicks essential when it comes to ranking your page on the search engine? Well, search engines useclick-through rates to rank web pages. It is, therefore, necessary to use relevant, descriptive, and appealing words to entice the online readers to click on your URL. To meet these requirements, you should consider the following factors while writing the meta tags. To begin with, you should regard your Meta tags as a form of sales copy for your website. However, your Meta description should always represent the content of your website and even better, more appealing. Do not stuff the keywords. Let the keyword blend in with the rest of the text and read naturally as it possibly can. Never try to mislead search engines by putting deceptive title or description. Search engines are now intelligent enough to detect if your meta tags genuinely represent your webpage. Write the meta tags within the character limit. For Title tag, the character limit is 70. In 2018, Google has increased the character limit for the meta description from 160 to 320. If you are trying to rank well for Google, this is a perfect opportunity to add more valuable content to your meta description. You should not have duplicate meta description for any of your pages. Writing the same Meta description for multiple pages can get you penalized by the search engines.
. Now, let’s discuss how to craft perfect meta titles and descriptions for your Shopify store. A home page title and meta description should give the online users the right information about your shop in a prompt and concise manner. It should be cleverly written in such a way that it matches the search intention of the users as well as portrays the USPs of your store. Let’s say you are selling various kinds of handmade clothing for women. There may be hundreds of other stores selling the same thing. However, every store has something unique about it, and you need to know your USPs to stand out from the crowd. Check out the following example for a homepage title. Let’s dissect the above example. The first part is the brand name. The second part conveys what the store is about. The last part is the unique selling point or USP of the store. Now,** it’s not mandatory that you follow the exact format**. i) It should tell a little more about the page starting from where the title ends. ii) Should contain the target keywords naturally. Try to have the keywords within first 160 characters. iii) Great to have a call to action. The meta description of the Bunosilo is an excellent example of a homepage meta description. They have clearly stated what the store is about and used the keywords precisely in it. When displayed on the SERP, the search keywords are emphasized (is in bold) in the meta description which is helpful to attract users attention. The collection pages of your Shopify store have the most SEO potential if optimized properly. That’s why you need to craft the titles and meta descriptions for each of your collection pages very carefully. The title should clearly say what the collection is all about. Keep it clear and concise. In the above example, we can see from the URL that the collection is for Couples Matching Bathrobe. Now check the title, it clearly states about the collection. It also uses some more texts ‘Upto 30% Off’ to attract clicks. It also contains the brand name i.e Coupleskart. i) A little more info about the collection. ii) Different types of products in the collection. iii) The USP of your collection. 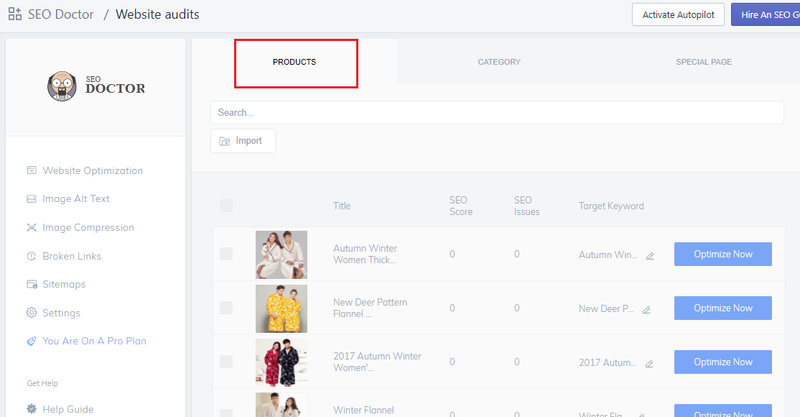 The product pages are difficult to appear on search ranking until it’s a unique product and you have lots of content on your product page. That doesn’t mean you shouldn’t optimize your product pages if you are selling common goods.There are chances that some of your product pages will come up on search results and will contribute to your store traffic. The best way to optimize your product pages is to optimize for LTKs or Long Tail Keywords. For example: nike sneaker is a short tail keyword while nike green black sneaker size 8 for men is an LTK. Optimizing for long tail keywords is very helpful as it’s more specific and narrows down the competition. Be very specific about your product and offering. Think it as how you will describe your product in just 70 characters if a customer walks in your brick-n-mortar store. In the above example, the product title conveys the product name precisely along with the shop name and price. You may not need to include the price as Shopify’s coding structure allows google to pick up the price of the product and show it separately as shown below. i) The variants of the product. ii) Useful specifications customers look for. iii) The USPs of the product. iv) Benefits, probable usage of the product. In the above example of Amazon’s product page, you can see that in the first part it talks about the specification (as it’s very useful for a product like TV) and the second part is about the benefits and USPs of the product. Now when you have a large inventory, it’s really difficult to go to each of your products and write the titles and meta descriptions all by yourself. The best way to handle is to use a Shopify app like SEO Doctor. With SEO Doctor you can manage all the Title tags and Meta descriptions for your product pages, collection pages and all other pages inside one dashboard. You can even put it on Autopilot for the product pages. The app will automatically fill the meta tags for the product pages. Let’s start optimizing your store’s SEO with SEO Doctor and boost organic traffic. Coming up with a relevant Meta tag may take a while so be patient enough to get it right. You might want to go through a number of drafts before finally settling the right tags that perform best on search engines.